Recent UPDATE: Please realize from any bid on www.reptilering.com or purchase from Boaconstrictor.com "AKA" Jsr.inc, from the time of Janaray 2016, we can only ship to your local hub to protect the saftey of your snake. We have to ship to your closest Hub Fedex for Pick up Only. We can not ship to your door to guarantee live arrival. This is a heavy shipment time of the year. This is vital to the survival to the animal to get the live animal guarantee. We will not be able to guarantee live arrival druing this Month unless you are are willing to pick up your animal at your closest hub or ship center from Fedex. If you have any questions contact www.shipyourreptiles.com for your closest hub for pick up through February. Our Shipping company won't allow us to ship if the weather from Utah to destination is above 37 degrees. We ship Worldwide. We applied for renwel Masterfile Cites license with the US Fish and Wildlife for our Captive Bred Reptiles. Our next permits should be here by December. This means we can deliver instant Cites. It is cheaper to have your animal delivered at major reptile shows to help combine shipping costs We don’t have to wait months to apply for permits. We also ship via Fedex to all USA customers. We can also ship through Delta Airlines. Animals are guaranteed to arrive properly Packed and healthy and live arrival is GUARANTEED. We have shipped thousands of animals successfully. We can ship same day orders if we have the order before 4pm. We Guarantee that your animal will live for 48 hours. We also offer the best guarantee in the business. If for some reason your animal does not make it after the 48 guarantee health arrival, we will give you a credit of 1/2 after 30 days as long as you keep us informed if you see anything wrong with your animal. Please contact us IMMMEDITLEY if you see anything wrong with your snake when it arrives. If you select Shipping fedex Priority; we Can't Guarantee live arrival if Fedex attempts to deliver and nobody is present to recieve the shipment by the scheduled time. NOTE: Shipping Contract with FEDEX: Please note we have shipped Thousands of Successful Shipments into the USA using Fedex. We have a contract with Fedex to Ship Live animals. However, with EXTREME weather temperatures in order to Guarantee live arrival we need to ship to the closest Hub to your home. We can ship to your home, however, we can’t guarantee Live with Extreme Temperatures. Also, Fedex gives us good rates, and they are usually on time. However, we do not get our money back if they are late. That is the contract I have so I can send them right to your home. We pack our animals very careful and drop them off at the latest Fedex time to make sure they animals travel in the fastest time without Stress. We use heat packs in the Winter and Cold packs in the Summer. All Aution wins on Reptile Ring require a mininum of a 50 dollar shipment fee and we combine all auction wins to save you shipping so you only pay one cost. If you have any problems with your animals, it is important to email us IMMEDITLEY to take advantage of your guarantee. If your Snake Arrives DOA You need to contact jeremy@boaconstrictor.com or 801-310-6857 leave a message within 2 hours of Delivery to confirm you were at your home when shipment was expected. We pack everything perfect with the correct method of packing. We can not GUARANTEE Live arrival in this situation if you do not contact us immediate within 2 hours of your timed arrival. We send out alerts and all Airbills prior to shipping. If you can show us that we did not send you the Airbill number we will always honor D.O.A's!!!! It is very important you notify us ASAP. Our Motto is a Happy Customer means multiple purchases, and we don't know anyone in the business who offers such a live arrival guarantee. All Auction Buyers in the USA will have COMBINED SHIPPING if they win MULTIPLE AUCTIONS not MULTIPLE animals in one auction. Most shipping charges fedex are 50.00 unless stated otherwise in the Auction. If you win an Auction Overseas, the Terms are described in the Auction and it is 100.00 added to the cost for delivery. During December and the first 2 weeks of January, we can only guarnatee live arrival if you accept to your local Hub in the USA through Fedex. 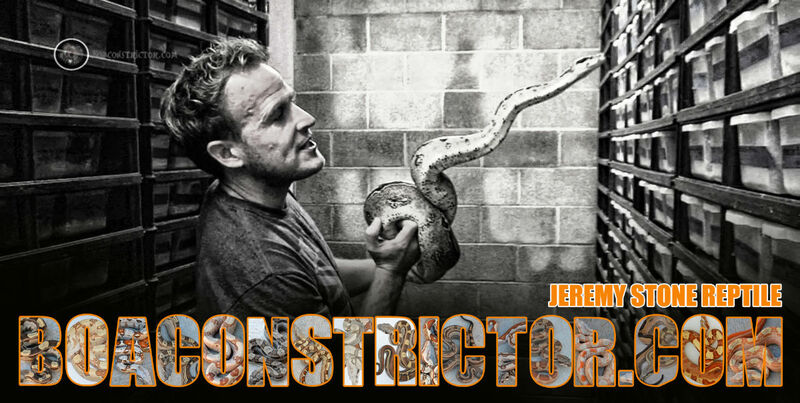 Contact me via email jeremy@boaconstrictor.com and I can give you the closest hub where you can pick up. Usually this is only 4 miles away if you live in Suburban Areaa. Somtimes it can be 10 minute drive but they usually get there priority overnight before the 10:30 Normal FEDEX priority Overnight. 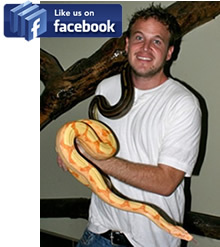 Contact jeremy@boaconstrictor.com for all details please or we can not give a gurantee of live arrival. We take all precautions to make sure you snake arrives safely.